Optoisolated 16 bit analogue input, in voltage or in current. Programmable as 0...5/0...10Vdc, 0...20/4...20mA through the indicator or through the PC with Dinitools. It may be integrated in the indicators for checking the flow and dosage, for remote programming of the setpoint of hourly flow. 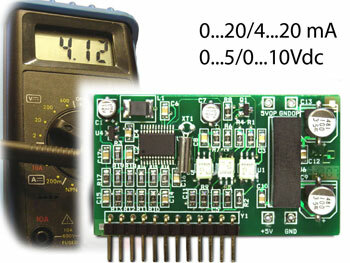 Reference values for input saimpling programmable from the indicator or from the PC with Dinitools: 0...5/0...10Vdc or 0...20/4...20mA. Reading speed: up to 100Hz (depending on the weight indicator). Maximum applicable resistance on the input in current: 250 ohm. Minimum applicable resistance on the input in voltage: 15 Kohm. NOTE: this board is an option available only when ordering the weight indicator. ADC16I Built-in analogue input, 0-4/20 mA, 0-10VdC (cable land excluded). A/D 16 bit converter, maximum applicable resistance on the input in current is equal to 250 Ohm, minimum applicable resistance on the input in voltage equal to 15KOhm. Compatible with DAC16O.